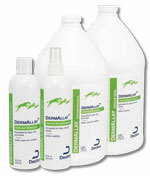 You are buying the Dechra DermAllay Oatmeal Shampoo Spray Cats Dogs Horses 1 Gallon, model #GOCW. At ADW Diabetes, we offer a wide selection of Dechra products for cats and dogs. At ADW Diabetes, we offer single and bulk packaging giving you the opportunity to save even more on the products that you use the most. The Dechra DermAllay Oatmeal Shampoo Spray Cats Dogs Horses 1 Gallon is for routine bathing and to promote relieve of dry, itchy, sensitive skin. Solubilized Colloidal Oatmeal provides temporary relief and sothing effect for itching and pain associated with allergic reactions. Safflower Oil (linoleic acid) aids in skin moisture retention and soothes dry, itchy skin. Ceramides aid in moisturising, repairing, and restoring dry, damaged skin.